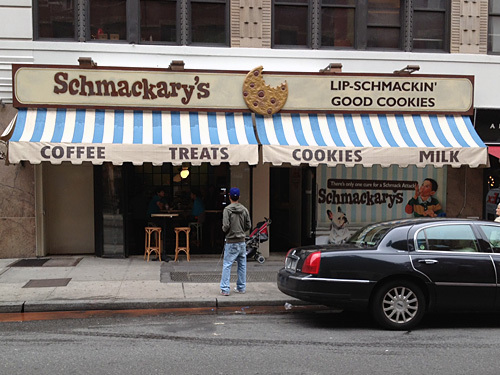 Schmackary’s didn’t do so hot in the 2012 Readers’ Poll for desserts, which was disappointing to me, because it’s at the top of my list for cookies around Times Square. In addition to fulfilling your cookie fix, though, there are plenty other options in their arsenal of sweets, including “Schmackaroons,” or coconut macaroons with the Schmackary’s twist. Usually $3 each, and without discounts when bought in bulk, the Schmackaroons don’t come cheap. But, on Tuesdays Schmackary’s treats Schmackaroons like cookies. Instead of $3, they are the price of cookies (pricing structure in this post), and if you buy more than one, the price per Schmackaroon is reduced. So, I purchased a cookie and a Schmackaroon and forked over $5, the price of two cookies. I went with the cinnamon chip Schmackaroon, which I highly recommend, but since flavors rotate daily, you’ll have to see what they have when you’re in the area. The outside brown bits tasted sweet and toasty, while the inside is unbelievably moist and melts in your mouth. 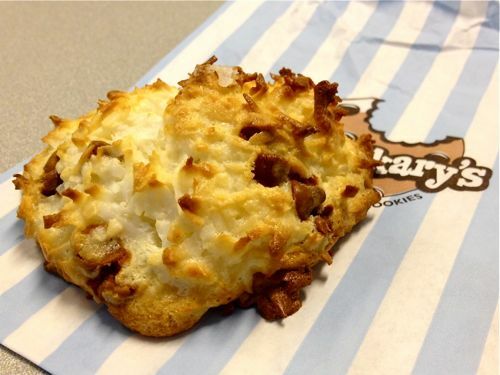 In fact, this might be the best coconut macaroon of my life. What Schmackary’s does really well in their treats is balance the base flavor of the dessert with the topping or flavoring. In this case, the cinnamon chips add just a hint of flavor and certainly do not overwhelm the coconut. Posted by Rachel Goldner at 1:15 pm, January 22nd, 2013 under Schmackary's, Sweets. FREAK OF TH……err……..wait, where is the Freak of the Week post?